Rated R for drug use, language, and some sexuality. There’s a whole lot going on in "Nico, 1988" concerning the not-often-discussed legacy of musical artist Nico, which is treated here with an unusual biopic. For one, writer/director Susanna Nicchiarelli seeks to let viewers know right off the bat that her real name was actually Christa Päffgen, and she was often addressed as such. As well, Nicchiarelli wants to stress that Nico was much more than just a collaborator with the Velvet Underground (as in their record, The Velvet Underground & Nico), with Trine Dyrholm's Nico stating explicitly, “My life started after the experience with the Velvet Underground,” and the movie taking place about 20 years after their classic album was made. And on a more intricate level, Nicchiarelli uses this later period in Nico's life as a moment to show the rare cinematic image of the woman bad genius. 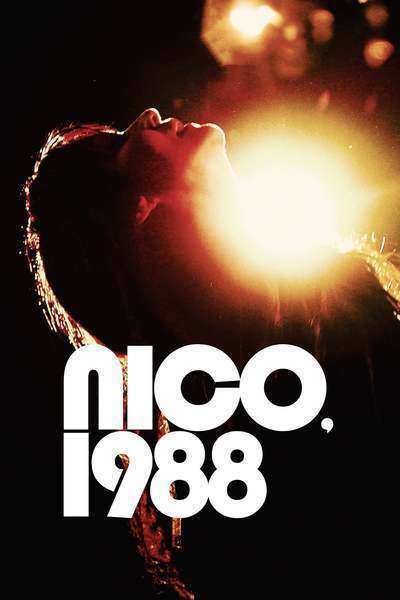 We get so many representations of brilliant men who are extremely flawed, dive head-first into their woes and soothe it all with drug abuse—“Nico, 1988” seizes a discography and tragic life story to further familiarize moviegoers with this specific kind of complicated soul. All of this is meant to be for a movie not to be taken as factual, as indicated by this film's end credits. Its plot-light story of Nico touring through Europe with a band in 1986 is designed to be impulsive and opaque, the details sometimes filled in by how she interacts with those closest to her like manager Richard (John Gordon Sinclair), or scenes of her falling back into self-destruction. But then there are also exposition-heavy scenes of her giving interviews talking about her past life, or the plot thread that doesn’t quite work involving her son, who is in a institution at the beginning of the movie after a suicide attempt. While Nico floats through so many things, unfazed by much about her career, her son Ari (Sandor Funtek) is the one concept that stops her dead in her tracks and fills her with regret. It becomes a hollow center for the movie, despite the amount of time spent on it. The major song choices, not all Nico compositions, are extremely particular, like Alphaville’s “Big in Japan” being used to touch on one’s importance in a land removed from your own; the song appears twice, with Dyrholm even singing it in the end credits. But its visual compositions are noteworthy too, the way that Crystel Fournier’s cinematography achieves a non-showy precision with framing people, whether inside colorful buildings or in an underground show in Czechoslovakia. And there’s a special boost that Nicchiarelli gets from including footage by Jonas Mekas, whose films like "Walden" are sprinkled throughout this movie, offering documentary fragments about the earlier days of Nico. They play out like the real images that the real Nico saw in her head. But the movie is best of all a showcase for Dyrholm’s full-fledged interpretation of Nico, who is distinctly removed from the poppiness that appeared in her earlier work, whether it's the Velvet Underground & Nico or her solo record Chelsea Girl. Dyrholm leads with an incredible imitation of Nico's iconic low singing voice, as shown in a few powerful musical scenes. Halfway through the film and with a jazz piano accompaniment, she croons Nat King Cole’s "Nature Boy." She provides a ghostly quality to that last lyric, “The greatest thing you’ll ever learn, is just love and be loved in return,” singing it as if to remind herself that she failed to learn exactly that. Or later, a performance of he song “My Only Son” shows a deeper, darker pain, and you watch her hold the song’s last note desperately as if she’d rather her lungs burst first. On and off stage, Dyrholm captures Nico's intensity with an intense gaze, and exhibiting a restlessness with her body that often feels primal. Throughout this ambling but sometimes poignant film, this take on Nico does not care one iota of what others think about what she wants to express. "I don't need everyone to like me, I don't care," Nico states, in one of the movie's more pointed passages. For better and for worse, the film thinks the same way.